There are many factors that influence the cost of construction. Some are obvious: land acquisition, permits and construction costs. Then there are the future costs or life-cycle costs to consider: maintenance, repair, replacement—the cost of keeping the facility and its systems up and running. One of the most effective ways to control construction costs is to establish early involvement on behalf of the owner AND the contractor. 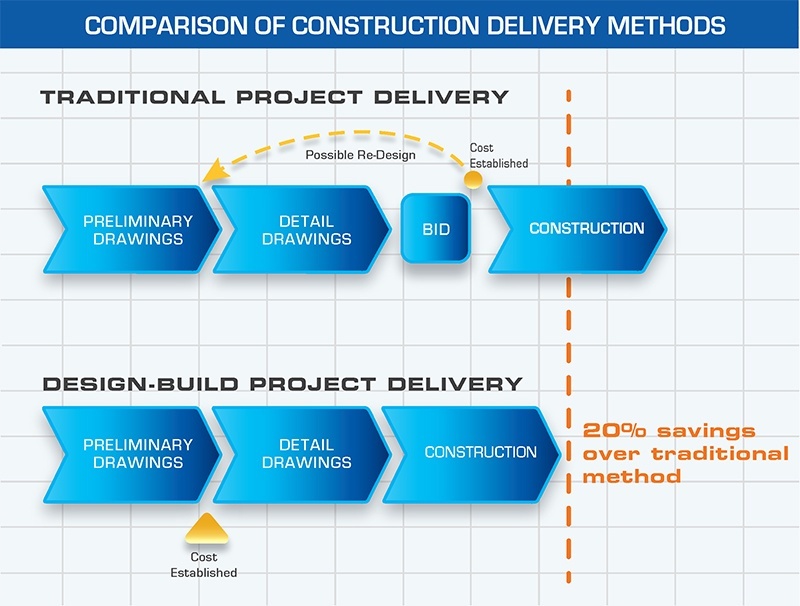 This may seem obvious, but under the traditional method of construction delivery, the owner commissions an architect or engineer to prepare drawings and specifications, then separately selects a contractor by negotiation or competitive bidding at a later stage in the project’s development. Global Link Distribution's new Elkhart, Indiana facility consolidated several operations under one roof—a solution that has enabled them to grow well into the future and has allowed them to strengthen their strong, diverse supply chain. Global Link Distribution is a leading supplier of OEM products for the RV, manufactured housing, cargo trailer, fencing and cabinet shop industries. Founded in 2007, Global Link’s product offerings include locksets, fasteners, latches, drawer slides and cabinet hardware. They also perform research and development in their quest to provide the highest quality service to the growing RV industry. Over the course of eight years, as Global Link had grown, they had leased multiple facilities to store their inventory. By 2015, they found that constant driving to multiple locations to fill orders and stock inventory was wearing out their employees as well as their company trucks. They needed a solution that would consolidate their operation under one roof—a solution that has enabled them to grow well into the future and has allowed them to strengthen their strong, diverse supply chain. BEFORE: Working with Optronics, our design-build team determined that the new, larger building would require a thorough retrofit to fit Optronics' growing needs. The new facility, although bigger, was not fitted out exactly as Optronics needed. When Optronics International, LLC, the nation’s fastest-growing manufacturer of lighting for the truck, trailer, marine, RV, heavy duty, and transit vehicle markets, realized that their small, leased facility was no longer meeting their needs, they decided to purchase a larger building in nearby Goshen, Indiana. The new facility, although bigger, was not fitted out exactly as Optronics needed. That’s where J.A. Wagner Construction came in. J.A. Wagner Construction designed and built the new 32,300-square-foot facility over top of the existing building. B&B Molders, Inc. of Mishawaka, Indiana are innovators in plastic injection molding. The company, founded in 1963, has experienced tremendous growth over the years. In 2013, they had a problem. They had outgrown their Mishawaka plant and could not expand their facility on their existing property. The only direction to go was up. J.A. Wagner Construction designed and built the new 32,300-square-foot facility over top of the existing building in an effort to help B&B Molders remain completely operational during construction. J.A. Wagner is constructing several pre-engineered steel buildings for Welch Packaging as part of their $16 million plant and machinery investment. By the end of January—if the weather cooperates—construction will be complete on several new buildings for Welch Packaging in Elkhart, Indiana. Design-build construction began in May on what will be a $16 million plant and machinery investment to expand Welch Packaging’s capabilities. J.A. Wagner recently completed this 200,000-square-foot trailer manufacturing facility for Universal Trailer, located in Bristol, Indiana. Universal Trailer manufactures Featherlite, Haulmark and Wells Cargo trailers, among others. A recent Consensus Construction Forecast from The American Institute of Architects’ (AIA) projected that construction spending has risen in 2016 and that 2017 could show an additional 6.7% gain for commercial (non-residential) construction. This survey of the nation’s leading construction forecasters also suggests that some sectors will top that—for instance, commercial/industrial (7.5%) and office space (8.8%). Many owners have put off the decision the build over the past few years as the economy was weakened and the November election was creating a lot of uncertainty. Now that the economy has rebounded, we have seen an increase in construction starts and are listening to owners and their rationale for moving forward. The design-build delivery system for industrial and commercial construction has been increasing in popularity among owners for many years. Design-build, also known as “single source responsibility,” combines the planning, design and building efforts into a single team. Design-build is now used in approximately 40% of all non-residential, low-rise construction projects and market share has been growing by about 1% to 2% per year, according to the Design Build Institute of America. Why is this delivery system so popular? Why is it growing? Is this system right for everyone? The answer to the first two questions seems to relate to design-build being faster and less costly than design-bid-build and construction management. A study conducted at Penn State University showed that design-build costs were 4.5% to 6% lower than other methods and design-build was 23% to 33% faster. Additionall, quality was found to be equal or greater for design-build when compared to the other methods.